We now have a mailing list of people looking for this lamb. I’m looking for a RUSS No. 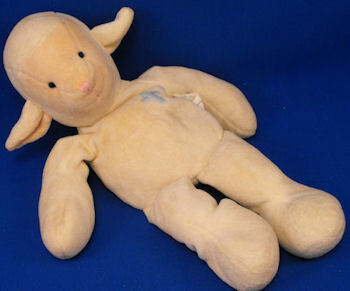 2790 plush 11 inch cream beanie velour lamb named LOVE, with tan velour face and ears. There’s a BLUE CROSS embroidered on the chest. This animal was given to my son the day he was born and he’s held onto it since today, when he is ten. It is in bad condition and cannot be repaired. Please help me find one of these lambs. thank you so much, i will go look at this right away, i cannot tell you how much this means to me, i was about to give up on my search.